This Green Chile Dip is the best combination of so easy to make and so, so delicious that it is almost dangerous. It is one of my favorite appetizers to bring to a party because it can feed a crowd and I haven’t met anyone yet who didn’t love it! 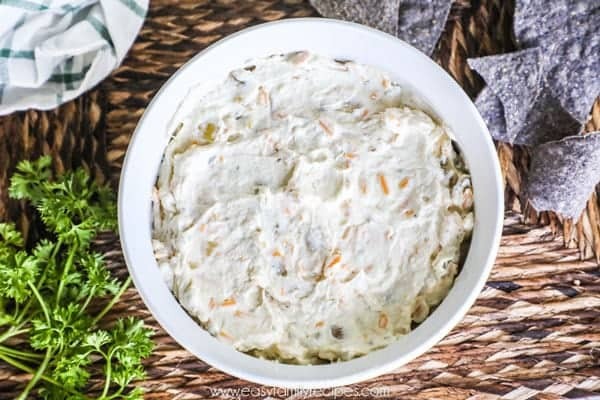 With only 5 ingredients plus salt and pepper you can have this super creamy dip from the fridge to the oven in minutes. The green chiles are mild so they give the dip a distinctive flavor without being overpowering and is friendly for adults and kids alike! Heaven people. This dip is heaven. This Green Chile Dip was originally inspired by my Green Chile Chicken Bake. It has been such a loved recipe on my original website that I got to thinking what else I might be able to use those same flavors in. I was munching on one of my favorites, Spicy Pimento Cheese, and it hit me. 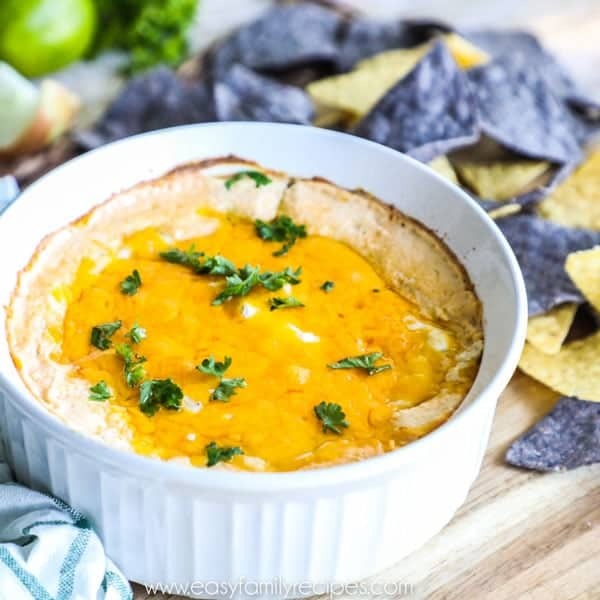 The answer is this dip! I spend a lot of time thinking about recipes, how to combine flavors and actually cooking and tasting it all. It’s a tough job I know… but someone has to do it! Last week I spent about 12 hours on my Friday working on a bunch of new recipes and this was by far my favorite! When I get a new favorite, I tend to try to ever so gently stuff it down everyone’s throat that comes through my door, ha! But really I say, “You HAVE to try this new recipe” to my friends far more than I would like to admit. This one has gotten absolute rave reviews from all of my willing taste testers so I really couldn’t wait to get it up on the blog to share with you. What is a green chile? The key ingredient in this dip is canned green chiles, but don’t fear… this recipe isn’t spicy so it is great for a crowd. Green chiles are a 6-7 inch fleshy pepper that ranges from mild to spicy with a distinct fragrant flavor. The southwestern United States, especially New Mexico, and regions of Mexico are the primary producers of these in North America. You can buy them fresh at the store or canned. Almost all of my recipes that use green chiles on Easy Family Recipes will use canned green chiles. I really, really love them as an ingredient to cook with because you get a ton of flavor plus some extra veggies when you use them. You can buy the canned green chiles already chopped so it makes for a super easy way to cook. I would eat it in a box, I would eat it with a fox… But really, I would eat Green Chile Dip on just about anything! I made this for the first day and dipped chips and veggies in it, and then a couple of days later I reheated the dip and then used it to make nachos, which were just about the most incredible nachos we have ever made at home. For a low carb “healthy” version use mini sweet peppers cut in half as the chips and layer this on with some shredded cheese, corn, black beans, and guacamole! Crackers- Brenton makes a nice gluten free crackers with beans that works really well with this! I am sure there are nearly endless possibilities of what to use this on. If you have something I missed, please let me know in the comments so I can try it! Follow along for the recipe below with my step by step instructions along with my notes, tips, and tricks I have learned along the way. If you just want the quick version, scroll on down to the bottom of this post for the recipe card. 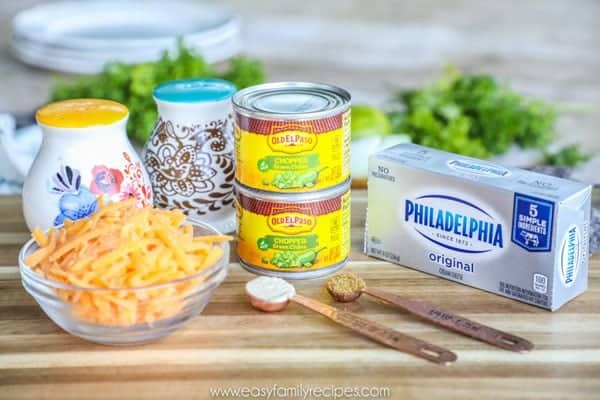 16 oz Philadelphia cream cheese– I use regular cream cheese, but light would also work. Fat free doesn’t melt well so I would avoid that. 2- 4.5 oz cans Old El Paso mild chopped green chiles- Old El Paso brand is my favorite because their chiles are a bit more crushed than I usually find in the other brands so they really combine well into dishes. 1/4 tsp cumin- You can add more cumin if you love this flavor! 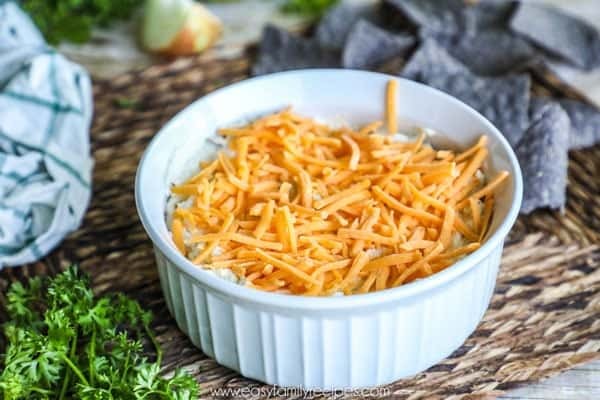 In a large bowl, combine the cream cheese, 1 cup cheddar cheese, green chiles, and all spices in a large bowl. Mix thoroughly until everything is combined. A couple of notes, first, make sure the cream cheese is very soft. It won’t combine as well if it is still cold or even just cold in the middle. If you don’t have time to let it sit out, it is best to stick it in the microwave for 15-30 sec increments, stirring in between until it is completely softened. The cheddar should be about half the total amount. The remainder will be saved to top the dip. Spread in a pie pan or shallow baking dish. 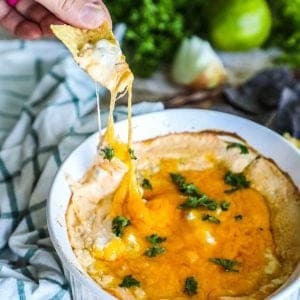 I like to use shallow dishes so that it cooks quickly and the cheese topping gets spread through each bite. Top with the remaining cheddar cheese evenly over the top. 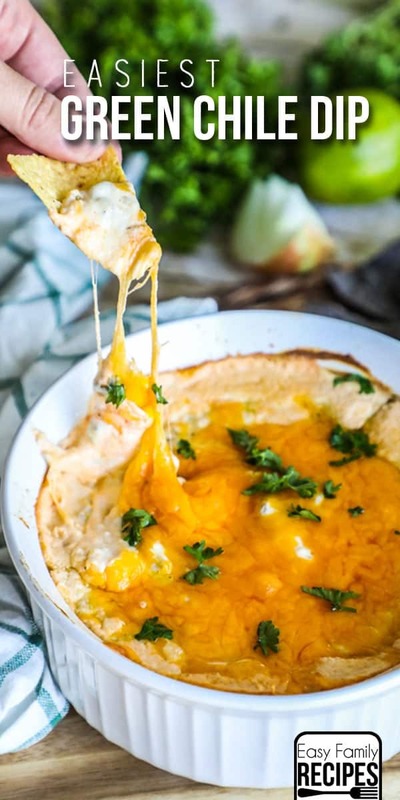 Bake at 350˚F for 20 minutes or until the dip is heated through and cheese is melted. If you are in a big rush, you can also speed this up by microwaving the dip. To use the microwave method, I would microwave it before you put on the top layer of cheese for 30 second increments, stirring in between, until it is heated through. Then top with cheese and either put on broil in the oven for 3-5 minutes or microwave one last time to melt the cheese. I really hope you love this recipe as much as our family! We will be making this for years to come and bringing it along to pot lucks and get togethers. If you have a chance to try it out and enjoy it too, I would love to hear from you in the comments! It makes my day to know others enjoy my recipes. Even better, snap a pic and tag me @easyfamilyrecipes on Instagram so I can see what you cooked up! 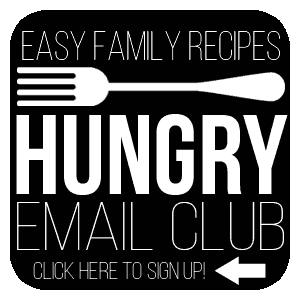 Oh… and before you go, if you love easy recipes as much as me, make sure to sign up for my Hungry Email Club. I share new easy recipes each week to help with ideas for getting everything from breakfast todinner on the table and all that’s in between. Sign up by clicking here, or on the button below. 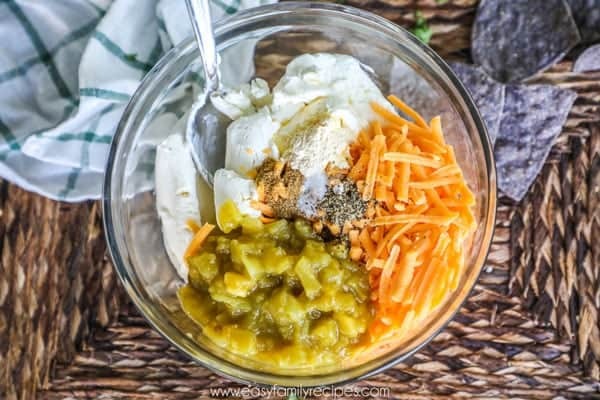 This green chile dip is creamy and delicious. It is made with two kinds of cheese, spices and mild green chiles. 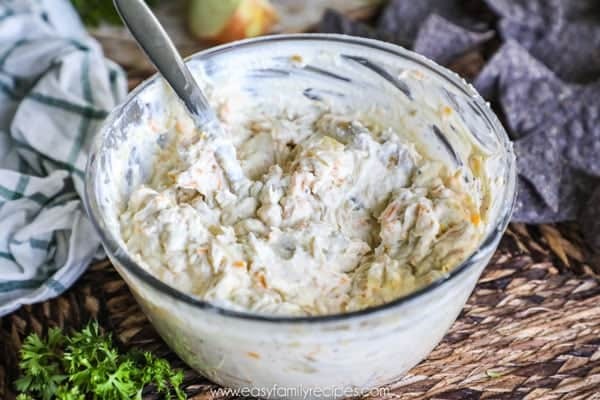 Green Chile Dip is a great appetizer to bring to a party and you can whip it up fast when you have unexpected company. Spread in a pie pan or shallow baking dish and top with the remaining cheese. Store leftovers in an airtight container for up to 5 days, or freeze for up to a month. Is there anyway to save recipes on here to go back to later?